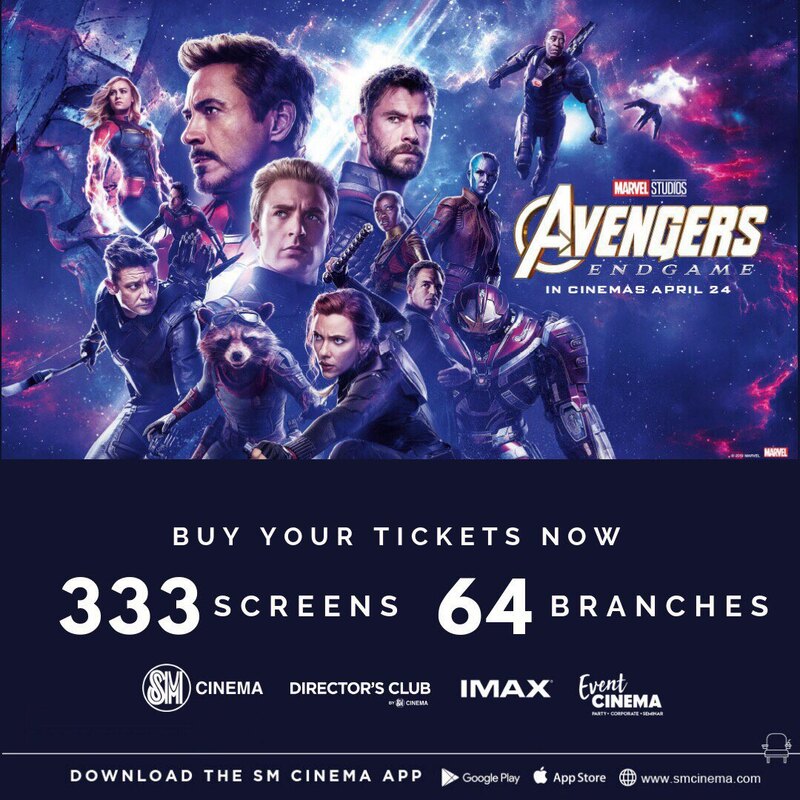 Adae To Remember: SM Cinema opens 333 screens across 64 branches nationwide for Avengers: Endgame! The coming of the most anticipated movie of the year is fast-approaching and SM Cinema is gearing up for the massive battle about to come! After more than a decade, everyone is anxious to watch the epic finale to this story that we have been following since 2008. This is why from April 24 to 28, SM Cinema will be showing Avengers: Endgame in all SM Cinema branches – and by “all” we literally mean all schedules of the 333 screens in Luzon, Visayas and Mindanao! You can catch the exciting comeback of Earth’s Mightiest Heroes as they take solo spotlight in all Digital 2D, 3D, SM Cinema IMAX, Director’s Club Cinema, Event Cinema, and Megascreen Large Format cinemas in any of the 64 SM Cinema branches across the country. No time to watch it during the day? We’ve got you covered as SM Aura Premier and SM Mall of Asia host 24 hour, non-stop screenings of Avengers: Endgame from April 24 to 28! Avengers: Endgame starts right after the grave course of events set in motion by Thanos that wiped out half the universe and left the Avengers ranks in fractures. The remaining Avengers are then compelled to take one final stand to attempt to save the world and defeat their greatest nemesis once and for all. Is the excitement over Avengers getting you hyped? Well we have more good news for you because ticket pre-selling has already started; so, book your tickets now and be among the first in the world to see the movie! Skip the lines, get the best seats in the house, and save as much as P20 by getting your tickets via www.smcinema.com or the SM Cinema App. Make sure to also subscribe to SM Cinema on facebook.com/SMCinema, twitter.com/SM_Cinema, and Instagram.com/SM_Cinema so that you don’t miss the latest digital promos and online activities. Avengers: Endgame is produced by Kevin Feige and directed by Anthony and Joe Russo. Louis D’Esposito, Victoria Alonso, Michael Grillo, Trinh Tran, Jon Favreau and Stan Lee are the executive producers, and Christopher Markus & Stephen McFeely wrote the screenplay.